Objects making up complex porous systems in Nature usually span a range of sizes. These size distributions play fundamental roles in defining the physicochemical, biophysical and physiological properties of a wide variety of systems – ranging from advanced catalytic materials to Central Nervous System diseases. Accurate and noninvasive measurements of size distributions in opaque, three-dimensional objects, have thus remained long-standing and important challenges. 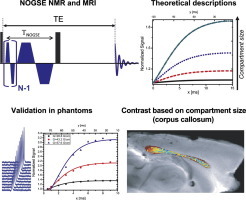 Herein we describe how a recently introduced diffusion-based magnetic resonance methodology, Non-Uniform-Oscillating-Gradient-Spin-Ec​ho(NOGSE), can determine such distributions noninvasively. 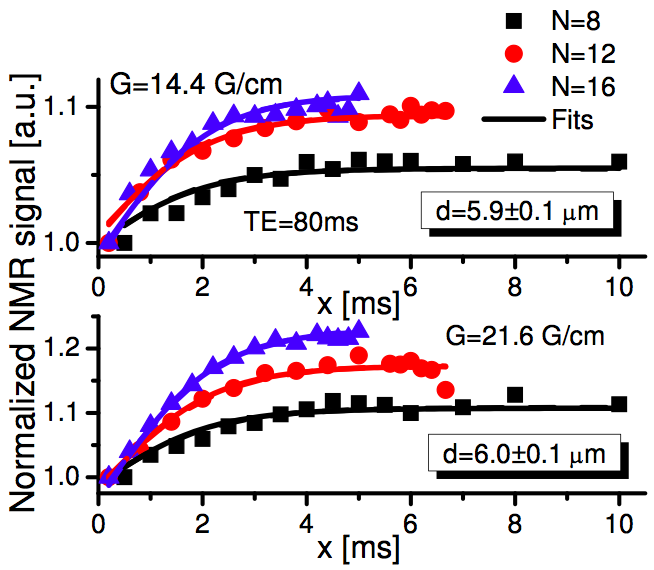 The method relies on its ability to probe confining lengths with a (length)^6 parametric sensitivity, in a constant-time, constant-number-of-gradients fashion; combined, these attributes provide sufficient sensitivity for characterizing the underlying distributions in μm-scaled cellular systems. Theoretical derivations and simulations are presented to verify NOGSE’s ability to faithfully reconstruct size distributions through suitable modeling of their distribution parameters. Experiments in yeast cell suspensions – where the ground truth can be determined from ancillary microscopy – corroborate these trends experimentally. 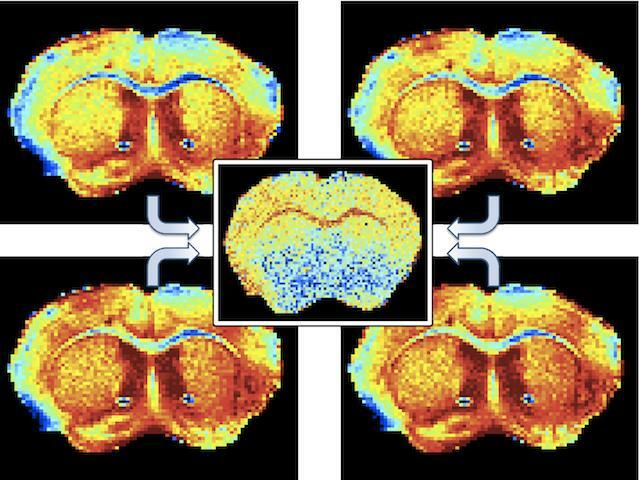 Finally, by appending to the NOGSE protocol an imaging acquisition, novel MRI maps of cellular size distributions were collected from a mouse brain. The ensuing micro-architectural contrasts successfully delineated distinctive hallmark anatomical sub-structures, in both white matter and gray matter tissues, in a non-invasive manner. Such findings highlight NOGSE’s potential for characterizing aberrations in cellular size distributions upon disease, or during normal processes such as development. via PLOS ONE: Size Distribution Imaging by Non-Uniform Oscillating-Gradient Spin Echo (NOGSE) MRI. Magnetic resonance virtual histology based on probing molecular diffusion in tissues. Non-uniform oscillating gradient spin-echo (NOGSE) sequences are applied to generate the magnetic resonance imaging (MRI) contrast. The compartment size distributions in a mouse corpus callosum are extracted highlighting the different anatomical regions. This entry was posted in Publications and tagged dynamical decoupling, dynamical decoupling noise spectroscopy, histology, Magnetic Resonance Imaging, magnetic resonance spectroscopy, MRI, NMR, NOGSE, non-uniform oscillating gradient spin echo, nuclear magnetic resonance, SDR, selective dynamical decoupling, tissue microstructure. Noam Shemesh, Gonzalo A. Álvarez, Lucio Frydman. Department of Chemical Physics, Weizmann Institute of Science, Rehovot 76100, Israel. J. Magn. Reson. 237, 49–62 (2013). •NOGSE, a novel diffusion MR approach for measuring pore sizes, is presented and analyzed. •NOGSE is based on a constant time and a constant number of oscillating gradients. •Experiments on microstructural phantoms, spinal cords and brains, validate NOGSE. Noninvasive measurements of microstructure in materials, cells, and in biological tissues, constitute a unique capability of gradient-assisted NMR. Diffusion–diffraction MR approaches pioneered by Callaghan demonstrated this ability; Oscillating-Gradient Spin-Echo OGSE methodologies tackle the demanding gradient amplitudes required for observing diffraction patterns by utilizing constant-frequency oscillating gradient pairs that probe the diffusion spectrum, Dω. Here we present a new class of diffusion MR experiments, termed Non-uniform Oscillating-Gradient Spin-Echo NOGSE, which dynamically probe multiple frequencies of the diffusion spectral density at once, thus affording direct microstructural information on the compartment’s dimension. The NOGSE methodology applies N constant-amplitude gradient oscillations; N − 1 of these oscillations are spaced by a characteristic time x, followed by a single gradient oscillation characterized by a time y, such that the diffusion dynamics is probed while keeping N − 1x + y ≡ TNOGSE constant. These constant-time, fixed-gradient-amplitude, multi-frequency attributes render NOGSE particularly useful for probing small compartment dimensions with relatively weak gradients – alleviating difficulties associated with probing Dω frequency-by-frequency or with varying relaxation weightings, as in other diffusion-monitoring experiments. Analytical descriptions of the NOGSE signal are given, and the sequence’s ability to extract small compartment sizes with a sensitivity towards length to the sixth power, is demonstrated using a microstructural phantom. Excellent agreement between theory and experiments was evidenced even upon applying weak gradient amplitudes. An MR imaging version of NOGSE was also implemented in ex vivo pig spinal cords and mouse brains, affording maps based on compartment sizes. The effects of size distributions on NOGSE are also briefly analyzed. via Measuring small compartment dimensions by probing diffusion dynamics via Non-uniform Oscillating-Gradient Spin-Echo NOGSE NMR. This entry was posted in Publications and tagged decoherence, diffusion dynamics, diffusion processes, dynamical decoupling, dynamical decoupling noise spectroscopy, Magnetic Resonance Imaging, magnetic resonance spectroscopy, Mouse Brain, MRI, NMR, NOGSE, noise spectroscopy, nuclear magnetic resonance, nuclear magnetic resonance spectroscopy, OGSE, Oscillating-Gradient Spin-Echo, pulse sequences, quantum control, quantum physics, quantum science, research, science, selective dynamical decoupling, spectroscopy nmr, spin dynamics, spin-echo, Spinal Cord, weizmann institute of science. During recent years, dynamical decoupling (DD) has gained relevance as a tool for manipulating and interrogating quantum systems. This is particularly relevant for spins involved in nuclear magnetic resonance (NMR), where DD sequences can be used to prolong quantum coherences, or to selectively couple or decouple the effects imposed by random environmental fluctuations. 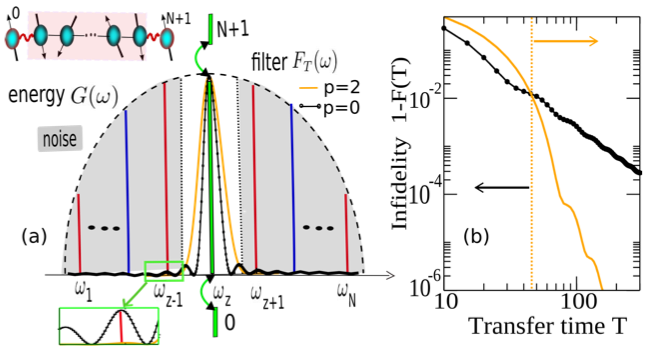 In this Letter, we show that these concepts can be exploited to selectively recouple diffusion processes in restricted spaces. The ensuing method provides a novel tool to measure restriction lengths in confined systems such as capillaries, pores or cells. The principles of this method for selectively recoupling diffusion-driven decoherence, its standing within the context of diffusion NMR, extensions to the characterization of other kinds of quantum fluctuations, and corroborating experiments, are presented. via Phys. Rev. Lett. 111, 080404 (2013): Coherent Dynamical Recoupling of Diffusion-Driven Decoherence in Magnetic Resonance. arXiv: [1305.2794] Coherent dynamical recoupling of diffusion-driven decoherence in magnetic resonance. 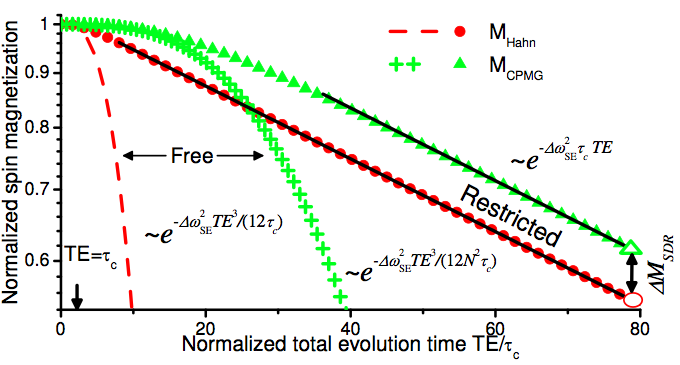 Time evolution of the spin magnetization under CPMG (N = 8 pulses) and Hahn-echo sequences for spins diffusing in a restricted space (circles, triangles), and under free diffusion (crosses, dashes). The solid black lines show the time range where the restricted diffusion effects dominate; the difference ∆M_SDR between these lines gives a contrast, over which signals can be coherently modulated by a suitable Selective Dynamical Decoupling (SDR) filter function. Experimental SDR signals normalized with the first data point (symbols) as a function of the x delays of the SDR sequence. The solid lines are analytical fittings of our model to the experimental curve. By using the measured diffusion coefficient D0 ∼ 2.3 × 10−5 cm^2/s, the fitted diameter d given in the plots is in agreement with the nominal value d = 5 ± 1μm. The behavior of the SDR curves resemble the root mean square displacement of the diffusing spins in a restricted space: in both cases curves plateu for times x larger than the correlation time characteristic of achieving a restricted diffusion regime, evidence a full sampling of the restricting space. This entry was posted in Publications and tagged capillaries, cells, decoherence, diffusion, dynamical decoupling, field nmr, gradient spin echo, magnetic resonance spectroscopy, NMR, nuclear magnetic resonance, nuclear magnetic resonance spectroscopy, pores, quantum control, quantum physics, quantum science, research, restricted diffusion, restriction length, science, SDR, selective dynamical decoupling, spectroscopy nmr, spin dynamics, spin-echo, weizmann institute of science. See comments of the talk at the Paraty 2013’s Blog: Decoupling system and environment. The ability to understand and manipulate the dynamics of quantum systems that interact with external degrees of freedom is a major challenge for fundamental quantum physics and its diverse applications, e.g., quantum information processing (QIP) or precision measurements. Progress in dynamical decoupling has lead to new ways to “protect” quantum bits from external degrees of freedom. Sometimes, however, a little bit of “recoupling” –i.e., exposure to the unknowns of the surrounding medium– can help. In this seminar, I will present a series of experimental methods implemented in NMR where by varying the “protection” given to the quantum states of ½-spins (qubits) can lead to new tools for characterizing unknown systems. In particular, I will show how Dynamical Decoupling noise spectroscopy can probe the spectrum of the environmental noise in order to find optimal methods for protecting the qubits . In a new twist, I will present a method termed Selective Dynamical Recoupling (SDR), where suitable designed pulse sequence applied to the spins can selectively address specific information from the probed systems. SDR can be used to measure coupling strengths to the environment via oscillatory modulations that can serve for example to probe chemical identities derived from chemical shifts . Alternatively, SDR can be designed to selectively measure the correlation time of the environmental noise where its value can be useful to probe diffusion processes in restricted spaces to extract the sizes of pores or cells in a non-invasive manner . Applications of this new and simple approach can be found in materials sciences and biology and in particular it can be useful for investigating the nature of tissue compartmentalization in vivo, in manners which eventually could be useful in human and clinical settings. G.A. Alvarez, and D. Suter. Phys. Rev. Lett. 107, 230501 (2011). P.E.S. Smith, G. Bensky, G.A. Alvarez, G. Kurizki, and L. Frydman. Proc. Natl. Acad. Sci. U. S. A. 109, 5958 (2012). G.A. Alvarez, N. Shemesh, and L. Frydman. Phys. Rev. Lett. 111, 080404 (2013). 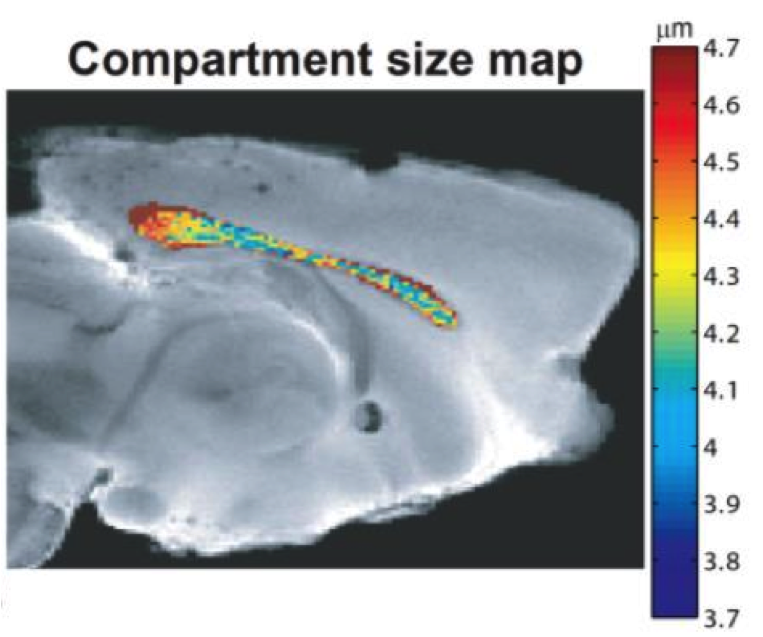 Compartment size map of a ex-vivo mouse brain masked for the corpus callosum. The compartment sizes were measured by implementing Selective Dynamical Recoupling pulse sequences to spin-1/2 carrying molecules for selectively addressing the correlation time of their diffusion process. This entry was posted in Press, Seminars and tagged decoherence, diffusion processes, dynamical decoupling, dynamical decoupling noise spectroscopy, NMR, noise spectroscopy, quantum control, quantum information processing, quantum physics, science, selective dynamical decoupling, spin dynamics, spin-echo. G.A. Alvarez, N. Shemesh, and L. Frydman. Phys. Rev. Lett. (2013) – in press. arXiv:1305.2794.